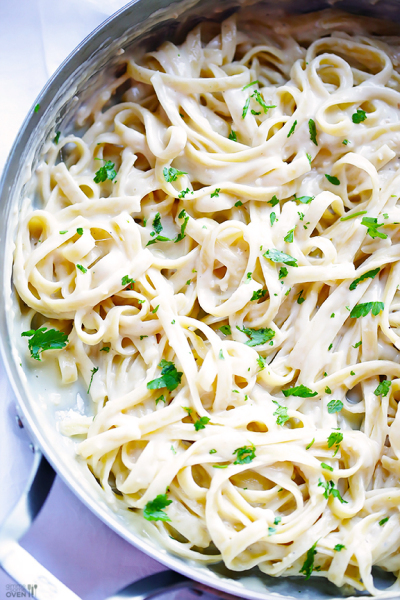 Real Alfredo should not include heavy cream (a little won’t hurt ;) - the creamy sauce is the result of an emulsion between the grated cheese, melted butter, and starchy pasta water. Recipe adapted by: Chef Rob Koeller of Culinary Concepts & Hospitality Consultants. 1. Cook pasta in a large pot of boiling salted water, stirring occasionally, until very al dente. Drain, reserving 2 cups pasta cooking liquid. 2. Transfer 1 cup pasta cooking liquid to a large skillet. Bring to a gentle simmer, then whisk in butter, a piece at a time, until melted. Whisking constantly, gradually add cheese, making sure it’s completely melted and incorporated before adding more. 3. Add pasta and toss to coat, adding more pasta cooking liquid as needed, until sauce blankets noodles completely. Serve topped with pepper and more cheese.